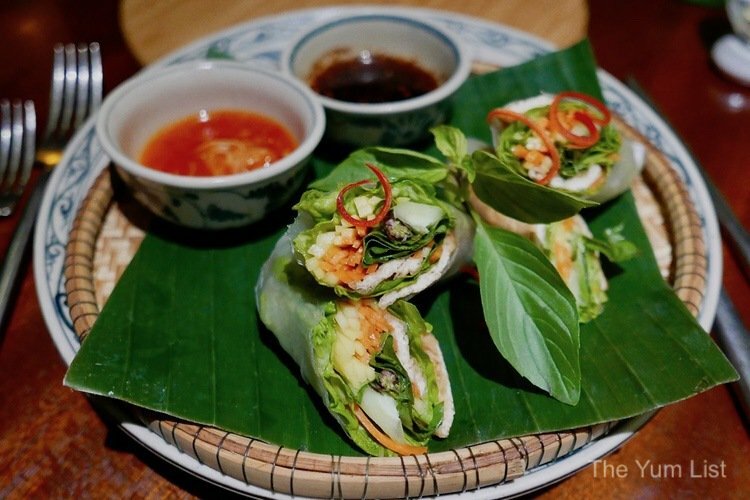 Rice Bowl, the downstairs restaurant partner to Rice Bar at Angsana Lăng Cô Resort, presents an Asian focus in the kitchen in a charming setting. 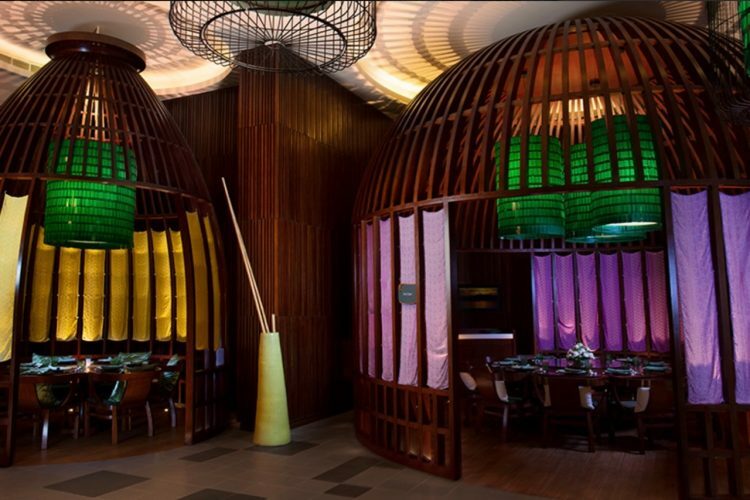 Giant cages resembling fish traps furnish spaces for two to twelve diners and a menu firmly based on the core ingredient of the region, rice, offers tempting recipes from all over Asia. My kindly waitress informs me that I can get rice and noodles from Korea, Japan, Thailand, Indonesia… basically from just about anywhere in Asia. She has some keen recommendations on the menu but I’m determined to begin the year with healthy choices so look for veg and steamed fish ensuring to save at least a little room for dessert. Tonight I’m dining with Brett Burton, General Manager of Banyan Tree and Angsana Lăng Cô. It turns out that he too has a taste for nutrition so between us we pare down the menu to satisfy our eat-clean penchants. I find it hard to go past Vietnamese fresh spring rolls and so it is that my first order is a meat-free version, Vegetarian Summer Rolls (VDN 200k). Marinated tofu gives a meaty feel along with loads of fresh veggies. A mildly spicy fish sauce makes great dipping. 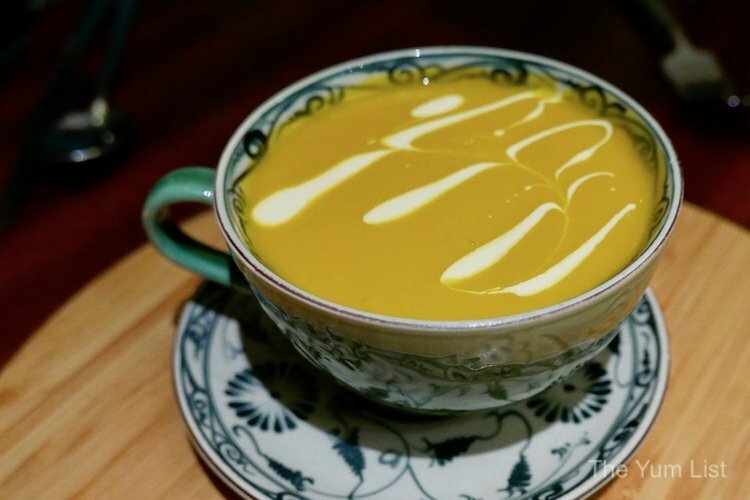 Pumpkin Soup (VDN 200k) is a very generous portion. It’s creamy and given texture with prawn and pork dumplings hiding inside. Brett, who is Aussie, says he thankful for all of the wholesome food available locally. This can also be made meat-free upon request. My pick of the mains is a light and tasty Steamed Seabass Fillet (VDN 460 k). It comes on a bed of bok choy with a pile of local herbs and a sweet and sour sauce. It’s not the sticky kind of sauce that might come to mind when you think of sweet and sour but rather a light liquid with a refreshing tang. It’s a great dish and surprisingly filling – especially with the bowl of rice that comes on the side. Please know that you can brown have rice too with a little insistence. 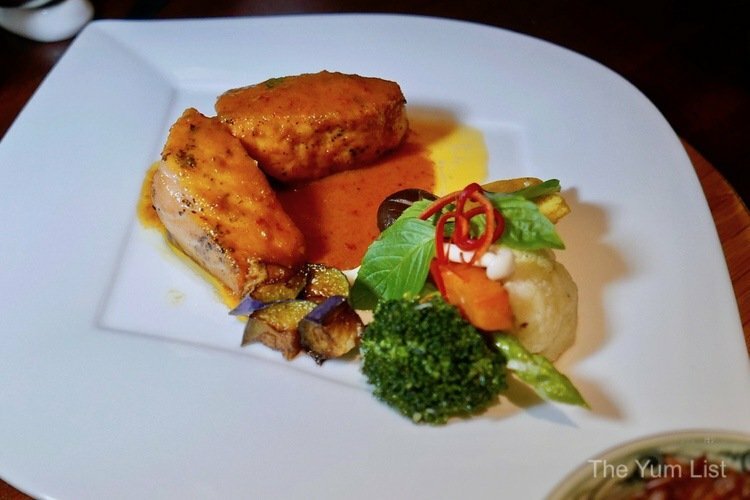 Gaeng Panang Salmon (VDN 500 k) is done Thai style with a seared Pacific salmon fillet coated in a red curry sauce made velvety smooth with coconut cream. Stir-fried veggies add more nutrition and Brett confirms that this is one of his most-preferred recipes. To conclude, Black Rice Soup (VDN 160k) is a sweet carby treat with a bowl of dark rice soup striped with coconut cream. Fresh fruit and yoghurt sides the bowl, either to be eaten alone or added to the soup. I like mine all mixed in. The tartness of the yoghurt breaks up the sweetness of the soup. 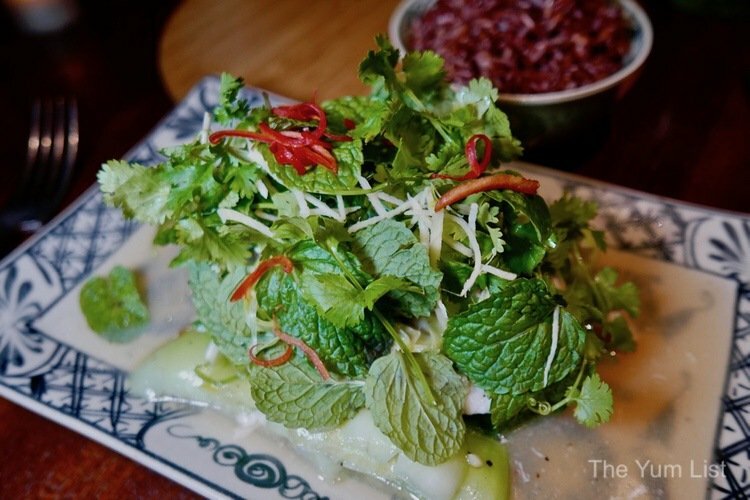 Reasons to visit Rice Bowl: charming setting; a good selection of dishes from across Asia; highly recommend the Vietnamese dishes with my top pick being the steamed sea bass. 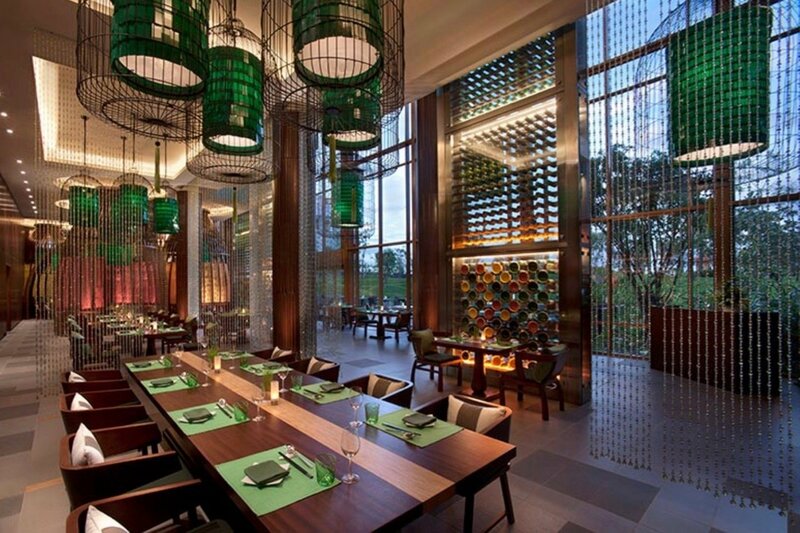 Find more luxury gourmet travel through Vietnam here. What beautiful interior views! I love how some of the dining areas are made cozy with the wooden enclosures. Entrees are enticing and well-portioned. Love all those herbs and leaves in their cuisine, Thai too. Very unique decor! This is the sort of food that I love.